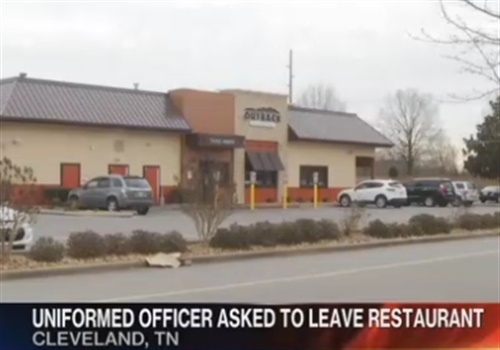 A Tennessee Wildlife Resources Agency officer was asked to leave the Outback Steakhouse in Cleveland, TN, Friday night because he had his service weapon on him. In a public post on Facebook, Officer Andrew Ward shared about the experience. He said he was asked by a manager to remove his weapon and put it in his vehicle. He explained that he had to have it on his person because he was in uniform, reports WRCB. According to the post, the manager made a phone call, then asked the officer to leave, citing company policy that makes Outback a gun free zone. Ward said Outback contacted him and apologized. They also gave him a $100 gift card. Ward said he and his family have accepted Outback's apology. He said they understand that a mistake was made. I was very saddened to hear the reports of a law-enforcement officer who was asked to leave a restaurant in this community. While I truly respect the restaurant for reaching out to the officer, our community must also show support to the men and women who place the badge on their chests every single day in order to protect the establishment in which the officer was asked to leave.